All hamburgers are not created equal. From the meat spectrum of juicy reds to dry dull grays, patties proliferate fast food joints, greasy spoons, pedigreed dines and catering halls across America. Factor in some really amazing burgers and, by all means, now is not a good time to be a cow. In the realm of the quick fix, I don’t have a beef with the renowned IN-N-OUT, it’s just that I’m not part of any particular budget burger cult. I’m also a fan of SUPER DUPER in San Francisco with its organic and green-grazing mindedness set to retro-cool style. And, of course there’s always the New York original that is Shake Shack for a nostalgia-minded burger and fries dine. But, for the moment what I’ve set my sights on and fixed my senses upon is the UMAMI BURGER, the recent Los Angeles import that recently opened in Greenwich Village. With UMAMI BURGER it’s supposedly all about the “fifth” food taste, aka “umami” – a sensory dimension that is described as a “pleasant savoury taste imparted by glutamate”. We’re not exactly sure what that means but the culinary scientist in you can find out more about it at the UMAMI INFORMATION CENTER. 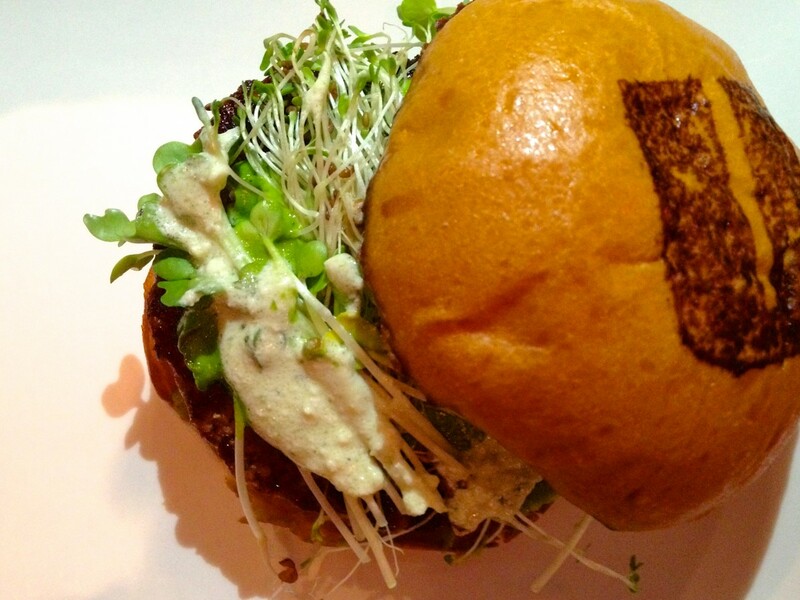 For now let’s just say that umami adds a little savory and salty something special into the mix at UNAMI BURGER. 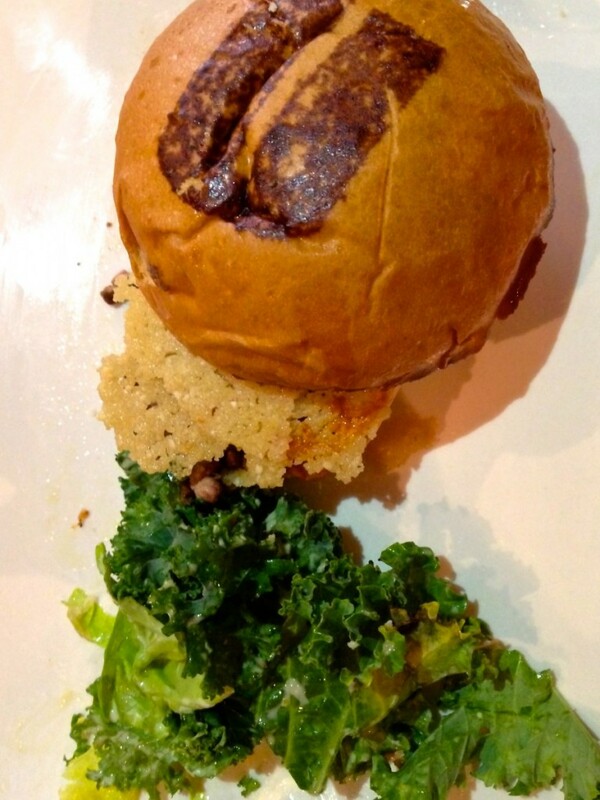 The Umami Burger achieves its flavor depth with a special beef blend (mid-western grass fed cows, duh, what else! ), shiitake mushroom, caramelized onion and roasted tomato ketchup all topped with a Parmesan crisp. Helps to have the fresh Portuguese style bun slightly toasted, its crumb ever so honey sweet. Feeling more robust? Then the lardon-loaded and cheddar-laden Manly Burger is a bacon cheeseburger lover’s dream. For those with a feeling for fowl skip the beef with the Greenbird, a pedigreed turkey burger layered with crushed avocado, butter lettuce and sprouts doused with a bit of green goddess dressing – it’s a moist and refreshing take on the dry and rubbery turkey burger you’re likely to be used to – I am glad these burgers are filling because with sticker prices hovering at $12, two of these “bunned” wonders might not fly. It can be lonely at UMAMI BURGER, with burgers arriving solo on their big white plates. That’s where a Caesar salad starring some sturdy kale makes for a great dinner mate. The exceptional umami ketchup is a star of the condiments tray and makes up for the otherwise unexceptional Thin Fries and an unnecessary pairing to the cinnamon and brown sugar laced sweet potato fries. Drinks? Live it up with a Californian wine or, on second thought, one of the crafted draft beers may be just fine. Room for dessert? It may be a good idea, especially with a scoop of Brooklyn’s Blue Marble sea salt caramel ice cream – a sweet way for you to awaken from a umami dream. UMAMI BURGER 432 6th Ave, New York, Tel. (212) 677-8626 No reservations and expect long waits during prime lunch and dinner hours.